I have just stumbled across a manual for anew VLF on it's way from White's. They have called it a Gold Master 24K. A modernised GMT with a bit of new ground tracking tech. If this is old news feel free to discard this post. Looks like they may have updated the GMT. It would be good to know if they are releasing it here in Australia. Looks like Whites utilised the MX7 control box and battery housing with the GMT innards, albeit with some refinements/additional features. Mentions that the detector is rainproof which still falls short on what the Makro Gold Kruzer offers, though probably fine for most prospecting forays. 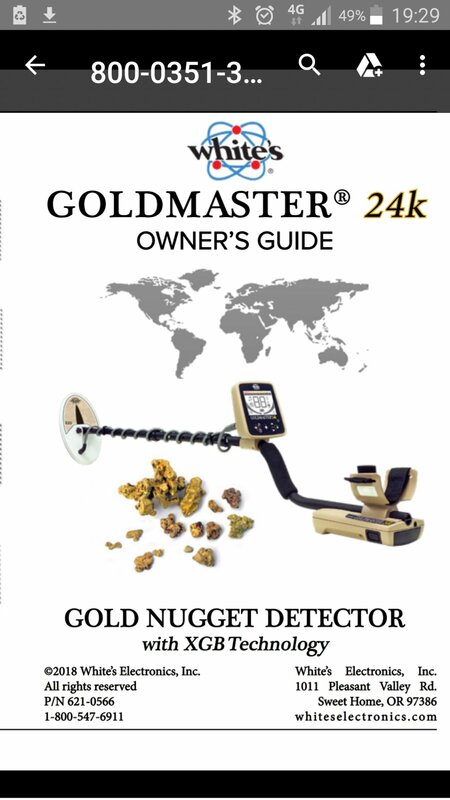 Will be interesting to see how the pricing stacks up against Makro and Minelab's Goldmonster, espeically considering the older GMT still retails here for a tad under $1500. By the Day To Remember video above, it sounds like the new 24K has the audio on steroids, sounds like its on boost. I like that. Yes, the 24k will be here soon at Maldon Gold Centre.